There’s yet another neat-looking event we’d like to add to our list of recommended seasonal Hudson Valley/Berkshires-area musical events: Yidstock, the annual festival of new Yiddish music, which takes place July 17-20. Yidstock 2014 promises to bring the best in klezmer and new Yiddish music to the Yiddish Book Center in Amherst, Massachusetts, and features some of the absolute top musicians in both the traditional and contemporary fields. 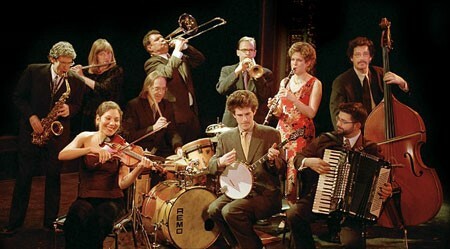 Set to appear at the four-day fest are the Klezmer Conservatory Band, the Klezmatics (sold out! ), Frank London’s Klezmer Brass All Stars with Eleanor Reissa, Daniel Kahn and the Painted Bird, and many others. Among the intriguing lectures and workshops is “Rocking the Stetl: The Essential Klezmer,” presented by local music journalist Seth Rogovoy (the Rogovoy Report). Yidstock 2014 will be held July 17-20 at the Yiddish Book Center in Amherst, Massachusetts. For a full schedule and ticket prices, call (413) 256-4900 or visit http://www.yiddishbookcenter.org/events/14/07/yidstock-2014-festival-new-yiddish-music.